Newly formed Hurricane Willa rapidly gained force and grew into an "extremely dangerous" Category 4 storm in the Pacific off Mexico on Sunday, with a potential to make landfall on a western stretch of coast between Mazatlan and Puerto Vallarta in the coming days. 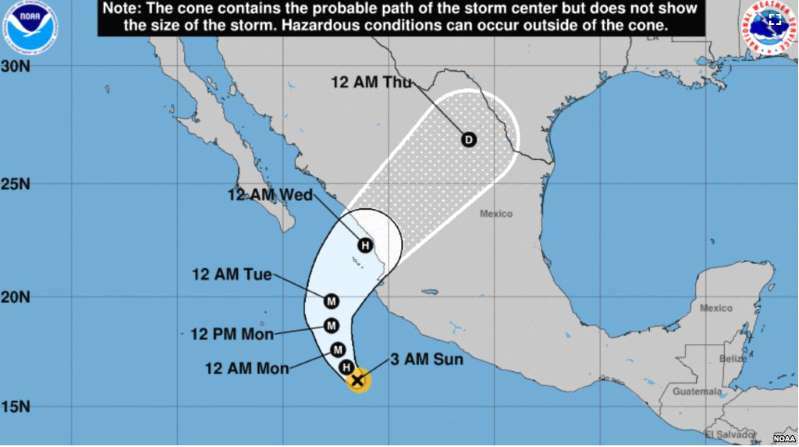 The U.N. National Hurricane center said in an evening bulletin that the storm was "forecast to produce life-threatening storm surge, wind and rainfall over portions of southwestern and west-central Mexico beginning on Tuesday." A hurricane watch was posted for a stretch of shore between San Blas and Mazatlan, while a tropical storm warning was in effect from Playa Perula to San Blas. Hurricane force winds extended out 25 miles from the storm's core and tropical storm force winds were up to 80 miles out. Willa was about 225 miles (365 kilometers) south-southwest of Cabo Corrientes with maximum sustained winds of 140 mph (220 kph). It was moving to the north-northwest at 6 mph (9 kph), but a turn toward the north was likely during the night or Monday. The hurricane center forecast 5 to 10 inches (12.5 to 25 centimeters) of rain across parts of western Jalisco, western Nayarit and southern Sinaloa states, with lesser amounts falling as it moves inland. Meanwhile, a weakening Tropical Storm Vicente appeared to be a less potent threat farther south. Forecasters said it was expected to weaken into a tropical depression overnight, while remaining just offshore or near Mexico's southern Pacific coast through Tuesday morning. Its core was about 230 miles (370 kilometers) southeast of Acapulco with top sustained winds of 40 mph (65 kph). The hurricane center said it could produce 3 to 6 inches (7.5 to 15 centimeters) of rain in parts of Guerrero, Michoacan, Colima and Jalisco states.